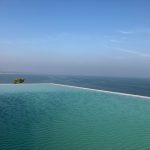 Where to eat in Chennai ? I am not too much of a lunch or a dinner person, but as a kid, it is the tiffin that has always fascinated me . So I decided to stick to just places we would go for breakfast or for a quick evening meal . While I have been to some of these Chennai eateries since childhood – food, being a great favourite of both my parents, it is Vasudevan who curated the list. We just went to two areas mainly – Mylapore and Sowcarpet with a stop over at Triplicane. This is by no means an exhaustive list and we hope to add to it as we go by. We also looked at Chennai eateries which are fairly old and are favourites with almost every citizen of Madras . The only street vendor we include is Amudha’s Bhajji stall in Mylapore. I dont think there is a name for the stall, but Amudha is in demand. 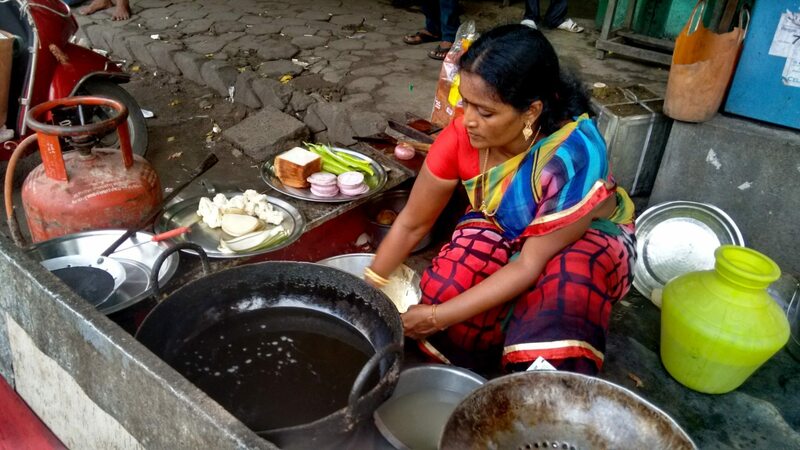 She has an entire set up in Mylapore, near Kapaleeshwar temple on the road and she is flocked by people, even before she prepares her dough. I met her during the Myalpore Festival and I decided to feature here here . Our first stop of the day is to Triplicane, an area that fascinates me immensely for its heritage, its architecture, its melange of cultures and the food. I want to stop at the Parthasarathy temple for a quick darshan and the puliodharai, but we are a bit late. So we say a silent prayer and continue to one of the oldest Chennai eateries, located in Triplicane, a landmark by itself – Ratna Cafe. Started in 1948 by a man from Mathura, Triloknath Gupta, the family still manage this very popular eatery. If there is one moment that defines our breakfast in Ratna Cafe, it is this – the waiter brings a contraption that looks like a saucepan and he pours the hot red sambar on the fluffy white idlis, until they are soaked in it. 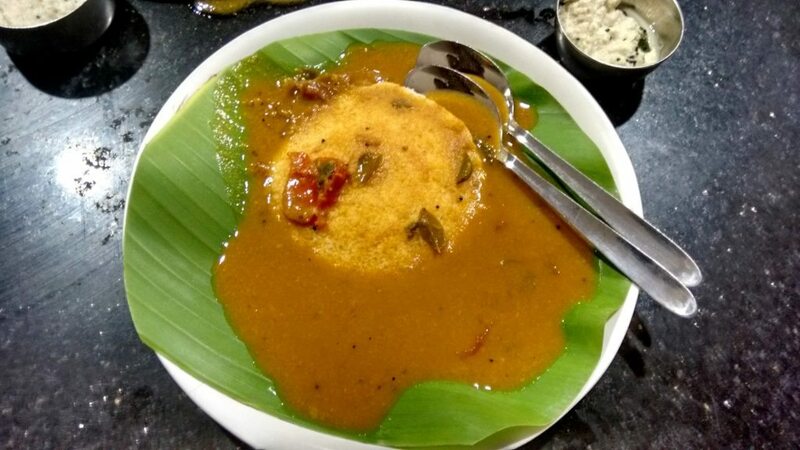 We order a plate of idli and vadai and top it with a plate of crispy golden brown ghee roast dosai, on the recommendation of a friend, Giridhar on twitter. The menu is packed in the evenings with so many dishes to choose from. A board announces the same right at the entrance. Our next halt in this list of Chennai eateries in Rayar’s Mess. It is one of the oldest and humble abodes which is very popular with most citizens of Madras, the Rayar’s Mess which has been around for more than 75 years in Mylapore. 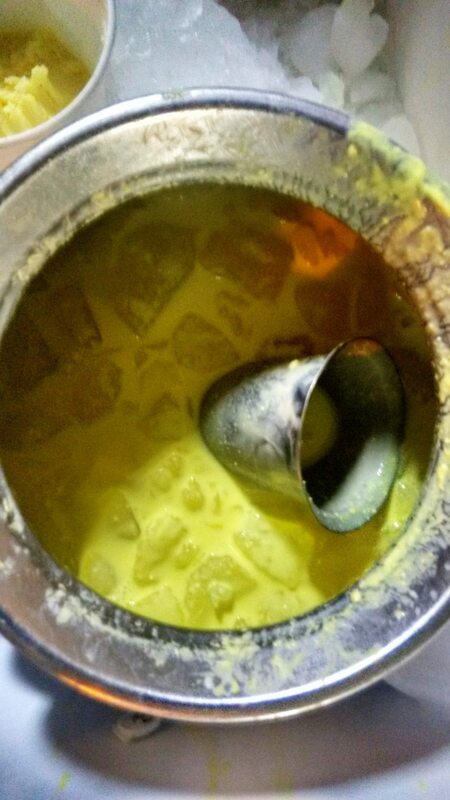 If there is one dish that is the signature dish, it is the kara chutney. Every foodie, including my father and his friends swear by it. 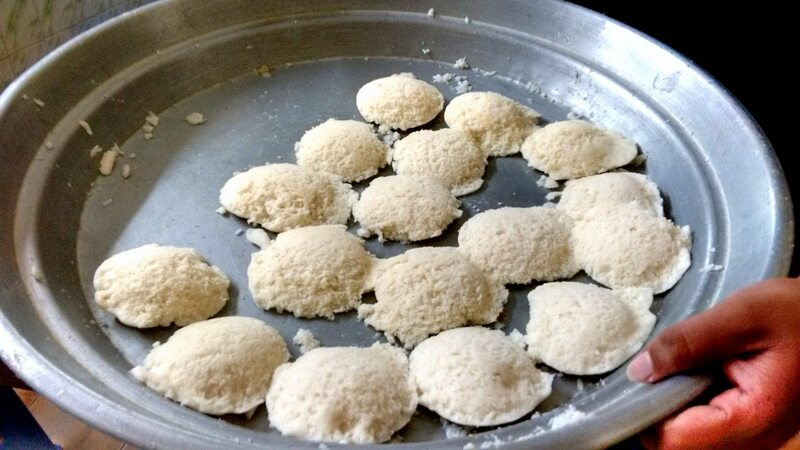 Vasudevan specifically likes the over fermented super soft idlis which literally melts in the mouth. The eatery comes alive in the evening with bondas, rava dosai, kal dosai, adai, vadai, a variety of sweets and more dishes. It feels like you are entering a temple. 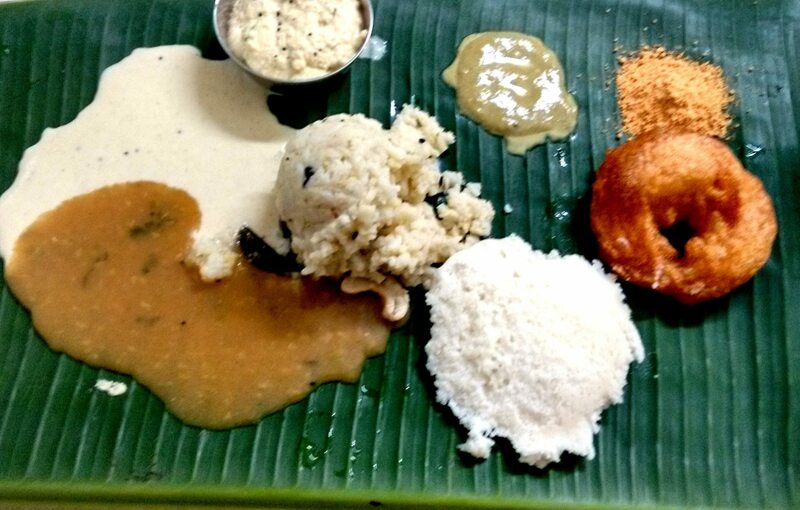 Right from the rangoli or the kolam on the steps to the large pictures of Gods and Goddesses on the walls to the various podis (powder) and pickles that is sold, everything about Karpagambal Mess is an ode to tradition. My earliest memory to this place was when it was a rather humble ode. Although it was renovated recently it is still more than 50 years old. 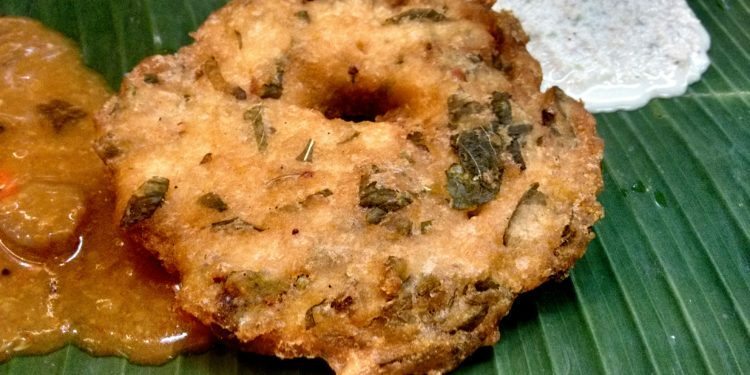 The dish according to us, that you must eat here is keerai vadai. Vasudevan is also tempted by the vazhai poo adai served with avial, which is absolutely delicious. Next to Bharatiya Vidya Bhavan in Mylapore is one of the Chennai eateries, popular with old timers and the young alike called Mami’s Mess. 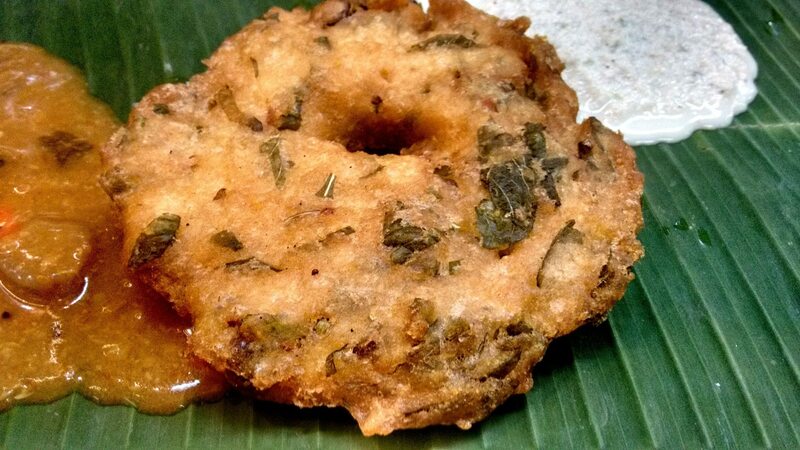 Vasudevan and another friend on twitter – Degreekaapi recommends that we head there to taste thavala vada. But we are unlucky. 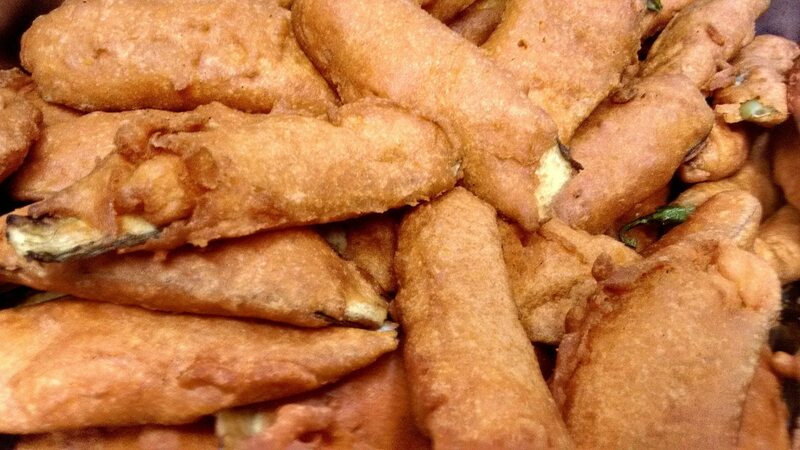 However our appetite is satiated with the bhajjis and bondas around. Customers flock to buy Kozhukattai, a sweet, a dumpling made with rice flour filled with wheat and coconut. Vasantha Mami apparently came from a small little village called Alvarkurichi in Tirunelveli which is very close to our ancestral village and she started this eatery in Mylapore. Her sons take care of it now. In a little lane around the Kapaleeshwar temple is a small green grilled window on the wall that serves sinfully delicious bhajjis. 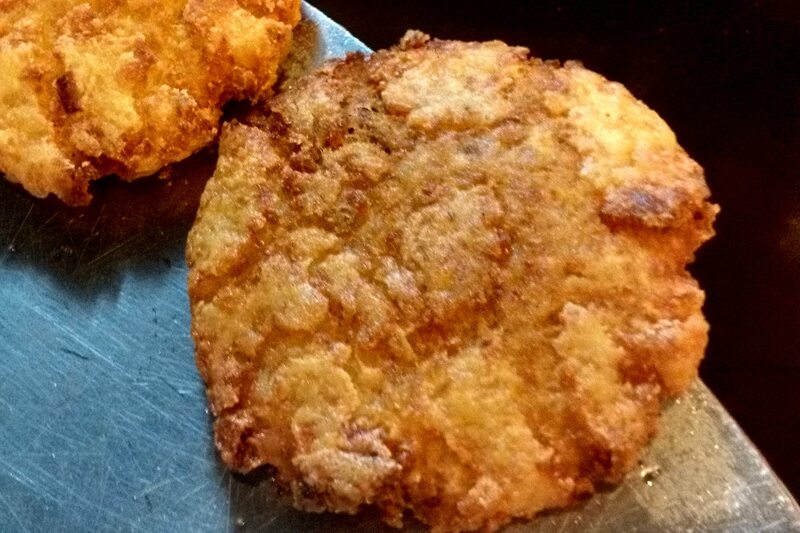 You stand here and eat to your heart’s fill, be it bhajjis or upma or idlis. Sadly there are shut as they had a wedding in the family. 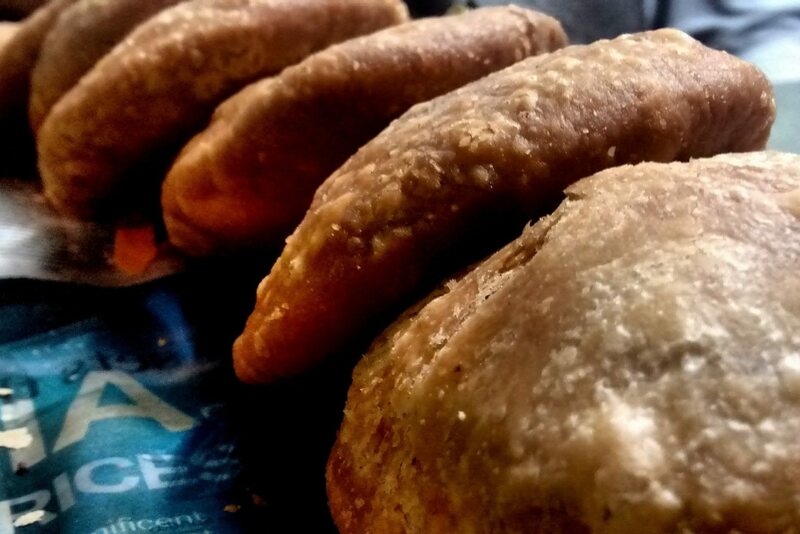 Vasudevan says the Vazhakkai Bhajji is extremely good and my parents are a bit disappointed that I cannot not buy some bhajjis home, but then, there is always another time. All in the same vicinity, it is very easy to miss this little news mart, a small shop hidden by trees. 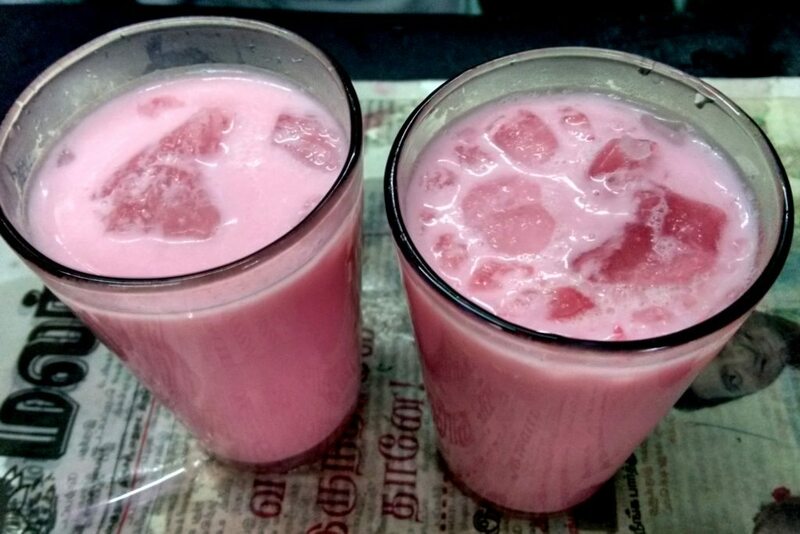 The headlines here scream of Rajinikanth and Sachin Tendulkar but what it does not scream about is the recipe of the rose milk which Mani and his family has safely guarded for over 80 years and sells it here fresh. I gulp glasses while Vasudevan buys the rose essence . A couple of women get off their two wheeler to drink panner soda, another speciality . Mani says celebrities have flocked to his shop. It is almost dark when we reach Mint Street and walking down the mini streets of Broadway and Parrys Corner is a delight in itself. As we navigate pedestrians, cows, cycle rickshaws, autos, tempos and cars, we find ourselves wondering if we are in Old Delhi or even Ahmedabad. Sowcarpet is one of the oldest locales in Chennai and my father who used to work here knows almost every eatery in the lanes. 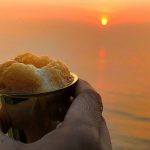 We head to Novelty Tea House at the recommendation of my uncle , Kannan and a mutual friend of Vasudevan and mine on facebook – Sreemathy Mohan. 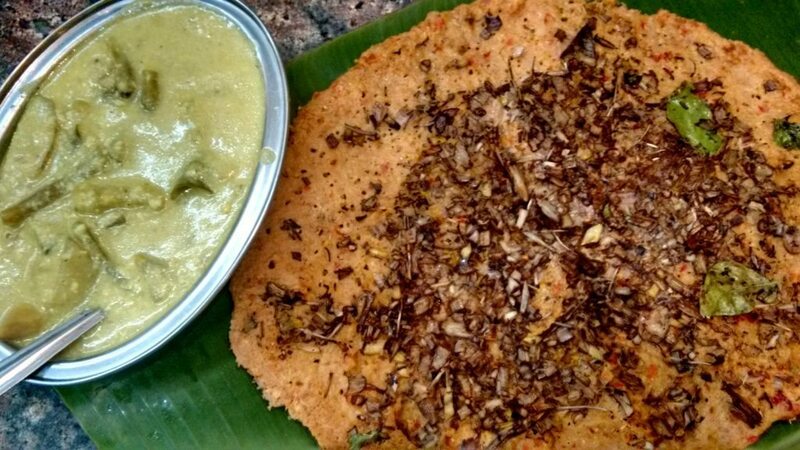 The pudhina onion dosai is what she recommended and that is what we order. 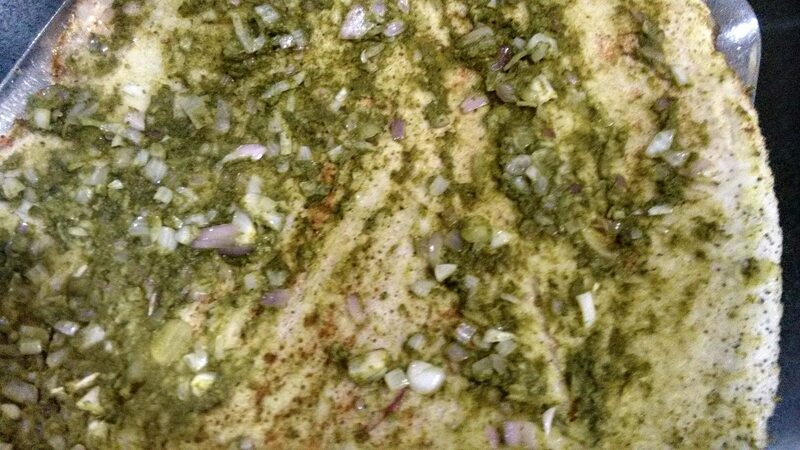 I definitely recommend it as well along with the pav bhajji. Novelty Tea House started as a tea stall in the late 50s by Chandrakant Moolchand Shah and it is now managed by the third generation. They do have branches everywhere, but do not miss the oldest eatery in Mint Street. The atmosphere is an experience in itself. There is a branch near my house near Purasaiwalkam but Vasudevan tells me that the the original should not be missed. So in a little stall, barely enough to house a man and his delicacies, is one of the oldest stalls here which sells vada pav and mirchi bhajji. Bhavin Mehta who has been here for more than 50 years proudly says that his is the best. Vasudevan agrees . And you thought, Madras is all about idli and dosai. I know of them since I was a kid as my father used to bring sweets and savouries home. Yet, when I land there today I am surprised to find a huge building, selling everything from jalebis to fafdas, chaats to badam milk. 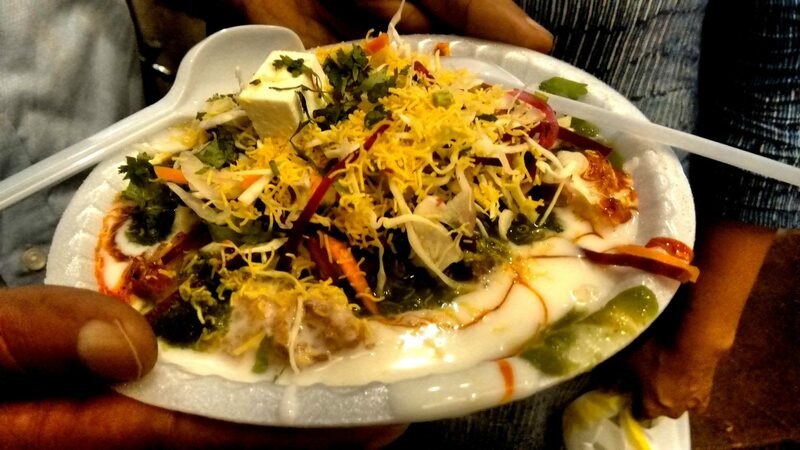 We decide to try out two of their most famous specialities – the aalu tikki chaat and the hot hot jalebis. I am a loss for words. You just have to eat it, sorry, devour it to experience it. They say eat, drink and be merry. We are eating and we are merry, but the drink is missing. So next door to Kakada Ramprasad, is the a former wrestler who speaks flawless Tamil with a great sense of humour, who came to Chennai from Patiala 27 years ago. The board says “Anmol Mohit Patiala, specialist in Kesar Lassi.” He also serves masala butter milk . He says he stands here everyday from morning till night, except on Sundays. ” My wife will divorce me otherwise, ” he says with a laugh as we gulp down the cold icy lassi down our throats . And finally the rains tumble down as we want to explore more eateries, but we run for cover and walk down the lanes to digest the entire spread from morning. I probably have to starve for the next couple of days and run miles to burn the calories, but then my love affair with Madras just got deeper. Bon appetite and enjoy the many flavours of the city. Are there any more Chennai eateries that you like to recommend ? On the Cooum Trail of the city listening to stories. 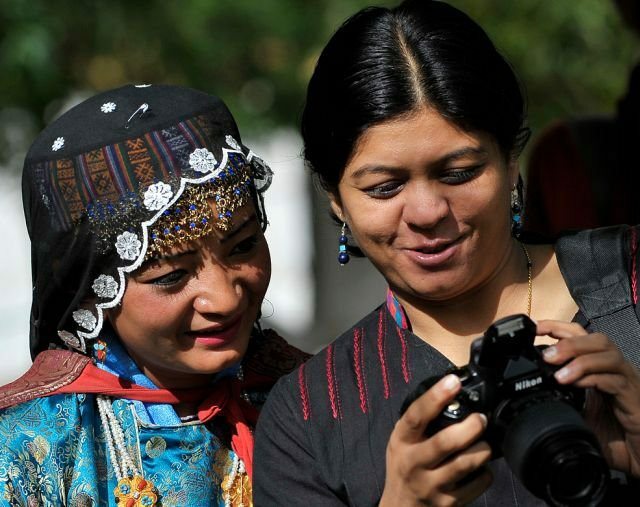 India through my eyes – Kiski band bajegi ? Since I am in Triplicane I used to go Ratna Cafe frequently. Other eateries I remember I have to taste after reaching Chennai. There is a bajji shop in sowcarpet which is 30 years old or even more. You must try it. It’s at Thatha muthiappan street, opposite to select theater. ( in the corner of the road) Its so special. As a youngster who lived in Kondithope area which is nearer to Sowcarpet, I have tasted in all the stalls you have reviewed. I think you have missed Hari Om Bhavan where you get tasty Basandhi, poori saguaro and masala appalam. Now I am 62 years old and remember to have eaten even when I was 15 years old. Been eating the shop should be more than 50 years old. It was in Mint street previously and some years bac, it was shifted to N S C Bose Road. Wonderful read, Lakshmi. Nice to know about these lovely eateries. Ten eateries blog was very nice. Though I have eaten in some , wish to taste the rest too. Good work. I am new to Chennai. Really good article, crazy on these. will start trying these. I was born and brought up in an area close to Mannady, i have tried almost of the eateries mentioned in Mint street and also Rathna cafe, I should try Mylapore. Now we have shifted to Annanagar in 1988 and forgot all eateries, thanks for reminding, i will take my children there. Very nostalgic and thrilled to see these names and photos. My nephew took me round most of the eateries mentioned around Mylapore when I landed in Chennai in 1988.The smells and atmosphere of Rayar’s mess brings to mind the Old World charm of MADRAS !Ratna Cafe was a landmark always. However their branch at Velachery could not survive for more than 3 or 4 years. 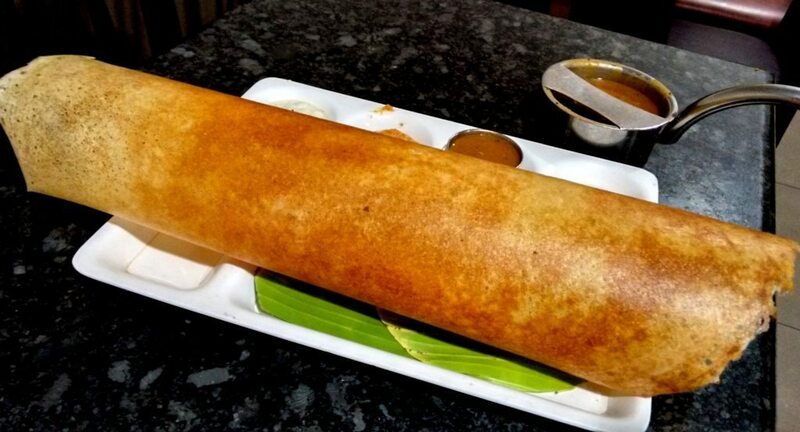 Later on when my wife took a course in Bharathiya Vidya Bhavan, she became a fan of Karpagambalngal Mess opposite.Adai Avial was her favourite then.Even now if we pass thro Mylapore near Kapaleswar temple we drop in at Karpangal.Late 90’s my workplace was in Mint Street. Being a very busy street, I used to rush through. I had sampled a few eateries there but I am unable to recall the names of the joints. Been almost 30 years since I lived in Mylapore, but just cannot forget the taste of those eateries in Mylapore and Triplicane. I have not been to Mint Street but now I will go with my family. Thanks so much. Or the other way round in Mint Street Chennai and the food in Mumbai/Ahmedabad..
Agarwal bhavan for samosa and lassi. Yummy. I am a customer for the last five decades . Courtesy is the tradition that atracts more . Looks Great. 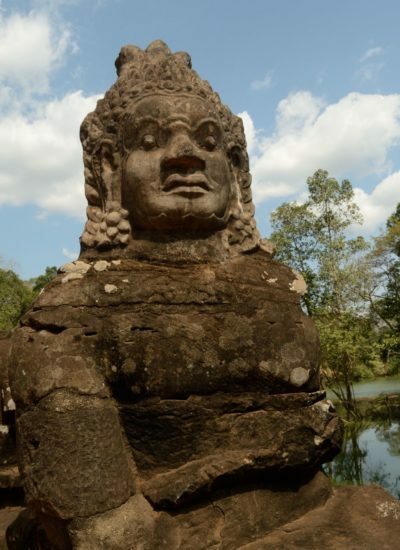 My next stopover will be here. Goodness.. 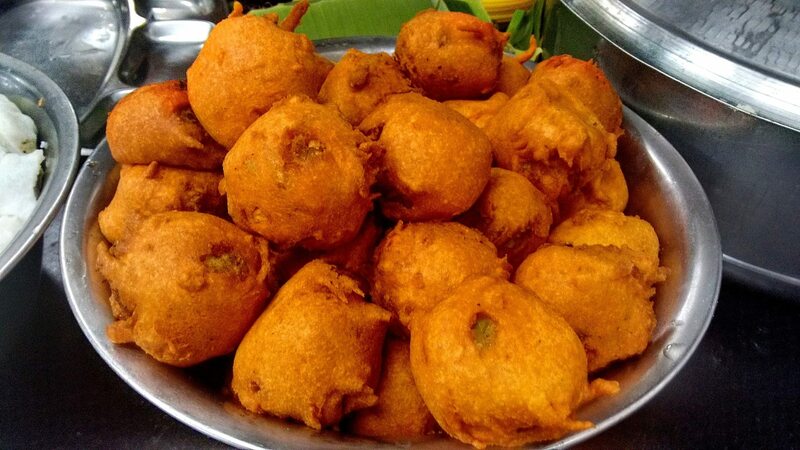 I had tasted a large portion of these spots, nothing to beat the Janak Kadhai bonda..
wow…you reminded me of my dear old Chennai. I have been holed up in Gurgaon for last eight year…now the urge to go back is that much more stronger. Thanks! Wow! A good article reminding me of my stays at Madras in the early 60s and then again later on in mid 90s– some of those in Mylapore and Mint Street have been very frequently visited places. Makes on desire to go back and have a round of these eateries again!! Thank you. 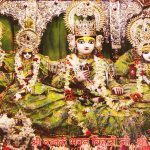 Probably you could add ( if it is still existing)– I used to be a regular for Gujarati food at a place called Sri Laxmi Vilas Lodge at Mint street. I loved their simple but good Gujarati lunch and dinner. This food trail was unavoidably mouthwatering…. Amazing compilation..
All eateries in Chennai which is included in this blog are good. I can’t say which one is good. But I like more Kalathi Stall, Mylapore. 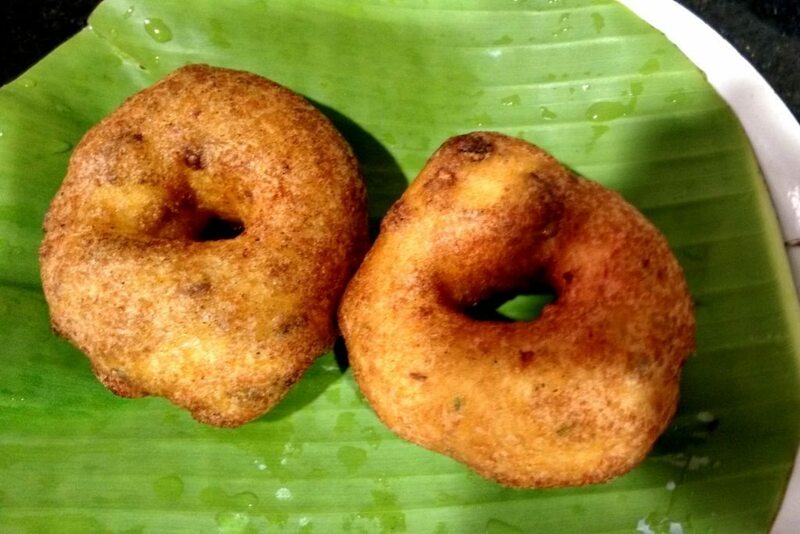 I really enjoyed reading your blog and became very nostalgic while reading Karpagambal mess.You mention “Ten old eateies in Chennai” Can we change the caption to “Ten good eateries” if you don”t mind. stunning… you helped me to remember my dear old Chennai. I have been stayed in Gurgaon for most recent eight year… now the desire to do a reversal is substantially more grounded. Much appreciated! 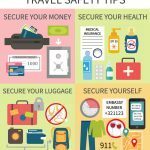 next month i’m going to chennai and try all these thnks for share info. Thanks for sharing mouth watering delicious dishes of Chennai. You just remind me of the mint street where our days spend so special. For someone who spent 40 years in Sowcarpet, and your title days old eateries of Chennai, Anmol lassi is a very recent entry in Chennai. You have missed out Prakash Bhavan on NSc Bose road and few others. Sorry I did forget one landmark hotel for authentic And hrs meals is National Lodge in govindappa naicken street, vasantha bhavan from Audiappa naicken street close to Ramnathan Goenka house. Excellent page where one can find the right place of authentic eateries..Thank you and keep updating this page. 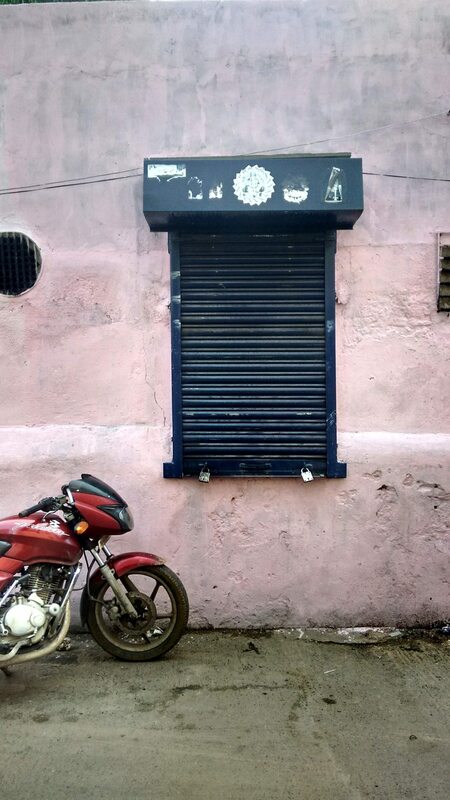 A great way of introducing to people of chennai, food joints that have an history about them. a really very informative narrative on the type of light snacks and drinks one can look forward to in these outlets. However, there is something missing, how do people find out these places? It would have been very informative and valuable if the addresses of these eateries were also mentioned. KARPAGAMBAL MESS IN MYLAPORE is WAAAAY TOOO OVER-RATED. It USED to be good many years ago, but definitely not so any longer. The quality and taste of the food has gone down hopelessly, service is pathetic, and prices are akin to daylight robbery. I live in the Mylapore-Alwarpet area, and have been avoiding this restaurant like the PLAGUE for the last half-decade.. I don’t know much about these outlets but I could feel the taste on my tongue as I scroll through this write. And, I am salivating!! !